Catch and Release is a way of life for conservation-minded fly fishers throughout the world. And this practice is gaining widespread popularity for all kinds of anglers as a means of preserving the fisheries for future generations to come. Here in Alaska one of the angler's problems can be the size of his or her catch and being able to properly handle the fish without harming it during the hook removal. 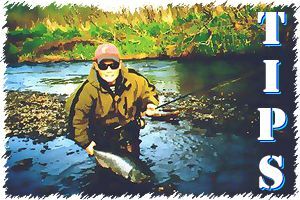 Salmon or trout of ten pounds or more can have a significant amount of energy and power remaining after being landed and will put up a struggle which can often lead to excessive force applied to hold the fish. Often too the ensuing struggle while trying to remove the hook will result in additional tissue and/or eye damage as the fish may twist on the tightly held hook. But even small fish deserve delicate treatment and are actually more susceptible to mortality than the larger fish. Once a fish has been landed, quickly turn the fish upside down and more times than not the fish will immediately become disoriented and cease struggling. Removing the hook becomes a great deal easier and the fish is left in much better condition for the release to follow.